How easy it is for us to take for granted the light of Christ which we are privileged to possess. This light however is given us to share! New Headmaster at St Joseph's: Mr David Garrido is to be inducted as the new Headmaster by Bishop Paul Hendricks on Wednesday afternoon. Please pray for us as we endeavour to find a new Head for La Retraite. Welcome to the nuns from St Elisabeth's Convent in Belarus: They are a Russian Orthodox community founded in 1999 in the outskirts of Minsk, Belarus who bear the name of the holy Martyr Grand Princess Elisabeth and has originated from the sisterhood bearing the same name. The convent currently counts just under a hundred nuns and around 300 sisters of mercy. Taking up the ministry of our patron saint the sisters of our convent provide spiritual and social help to the sick and the suffering. Since its establishment the convent has been patronizing 200 orphanage children and they also have a charity shelter founded on the farmstead of the Convent located 19 miles from Minsk for people who were led astray by the rough and tumble of life where over 180 residents live here today. The Convent provides the needy with comprehensive help, accommodation, meals and necessary medicines. A rehabilitation facility for females was established two years ago for female ex-prisoners, the homeless and the mentally challenged women. To support and develop the above ministries, more than twenty workshops and studios operate within the frameworks of the Sisterhood. These include sewing and embroidery shops, candle workshop, wood-carving, stone and blacksmith workshops and many more. We are sincerely grateful to St Bede’s allowing us to have a small display of our crafts this weekend in this way support us in this challenging, yet rewarding work. Easyfundraising: Did you know that whenever you buy anything online - from your weekly shop to your annual holiday - you could be raising a free donation for St Bede's Church? There are nearly 3,000 retailers including Amazon, John Lewis, Aviva, thetrainline and Sainsbury's, who will donate a percentage of the amount you spend to St Bede's to say thank you for shopping with them. It's really simple, and doesn't cost you anything. 3. Get shopping - your donations will be collected by easyfundraising and automatically sent to St Bede's. It couldn't be easier! There are no catches or hidden charges and St Bede's will be really grateful for your donations. Thank you for your support. Coloma Convent Girl’s School as well as the 2 other schools within their trust - The Quest Academy and The Archbishop Lanfranc Academy. The positions are part-time and periodically throughout the year. Experience is preferable but training will be given if necessary. For an application form please contact Miss Sallie Trembath on 020 8654 6228 ext 222 or email strembath@coloma.croydon.sch.uk. Closing date 12th February - applications should be returned to the Headmistress Mrs M Martin at Coloma’s school address. Church Cleaners this week: Saba Tekle, Nebiyat Zereome & Alem Araya Zemichael. 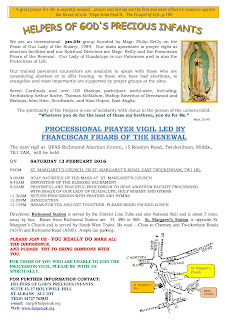 Helpers of God's Precious Infants - Upcoming Processions: The next procession will be on Saturday 13th February at St Margaret’s Church in Twickenham (starting with Mass at 9am and exposition of the Blessed Sacrament at 9.40). Please see the poster for more information. 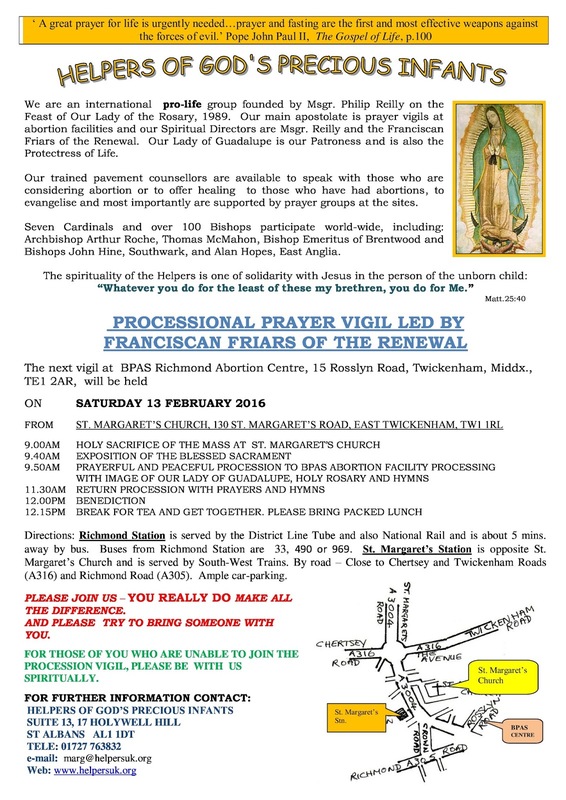 Walsingham Retreat 27 - 30th May: Please find attached Invite\ Booking Form and Provisional Programme for the retreat in Walsingham. We have only been able to book 30 places, so if you wish to come (and we hope you do! ), please get in touch as soon as you can. Jubilee Year of Mercy - 8th December 2015 to 20th November 2016. On 8 December, the Solemnity of the Immaculate Conception, Pope Francis opened a Holy Year of Mercy. Pope Francis desires that the year ‘will be steeped in mercy, so that we can go out to every man and woman, bringing the goodness and tenderness of God! May the balm of mercy reach everyone, both believers and those far away, as a sign that the Kingdom of God is already present in our midst!’ (Bull of Indiction 5) The Year will close with the liturgical Solemnity of Christ the King on 20 Nov.
4–5th March: “24 Hours for the Lord”: Pilgrimage to the Holy Door of Mercy St. George’s Cathedral, Southwark. United in adoration and prayer across the world, the 24 hours will start with Mass at 12:30pm. At 7.30pm we will have evening prayer to start a night of music, art, film, prayer and reflection led by SCYS. The sacrament of reconciliation will be available. Throughout the night we will have activities available in Amigo Hall. 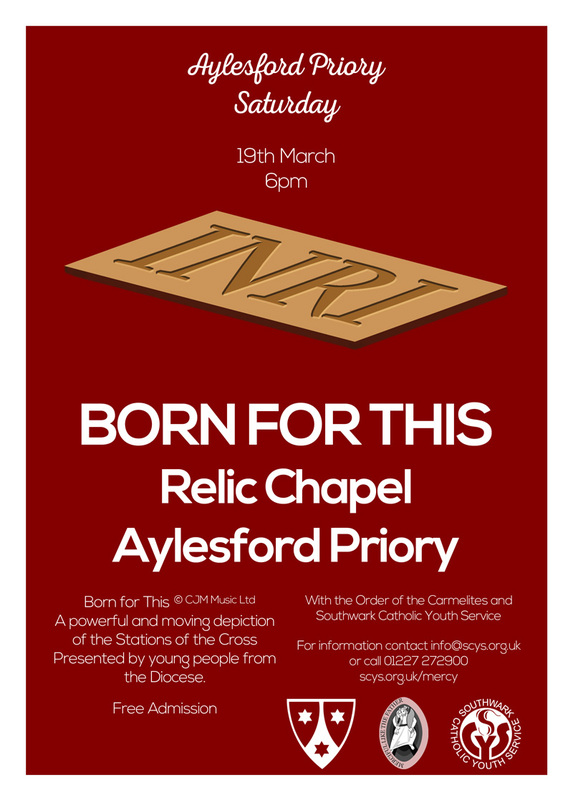 19th March: ‘Born for This’: A powerful and moving depiction of the Stations of the Cross presented by young people from the diocese at Aylesford Priory. 26–31st July: World Youth Day event in Krakow, Poland. 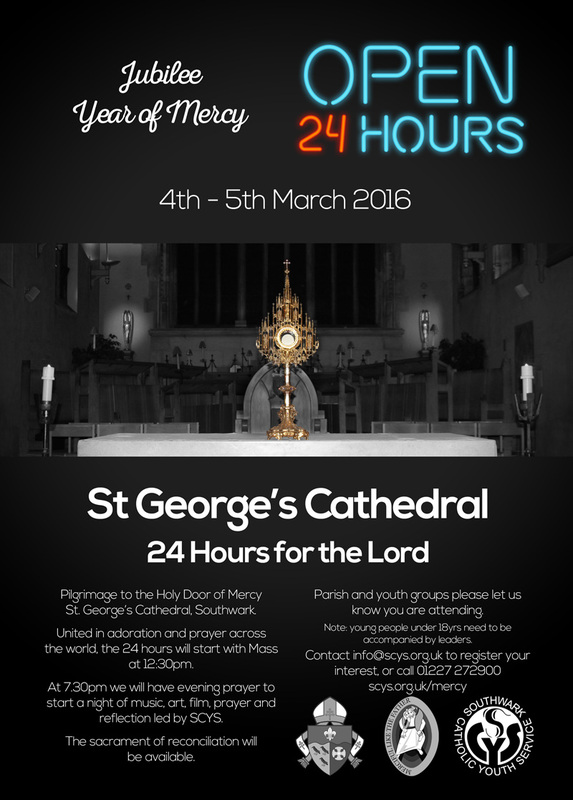 Open to all young persons 18+ See fr Pawel for application form. Please note young people under 18yrs need to be accompanied at these events by an adult (leaders/parent/older sibling). Contact info@scys.org.uk to register your interest, or call 01227 272900. 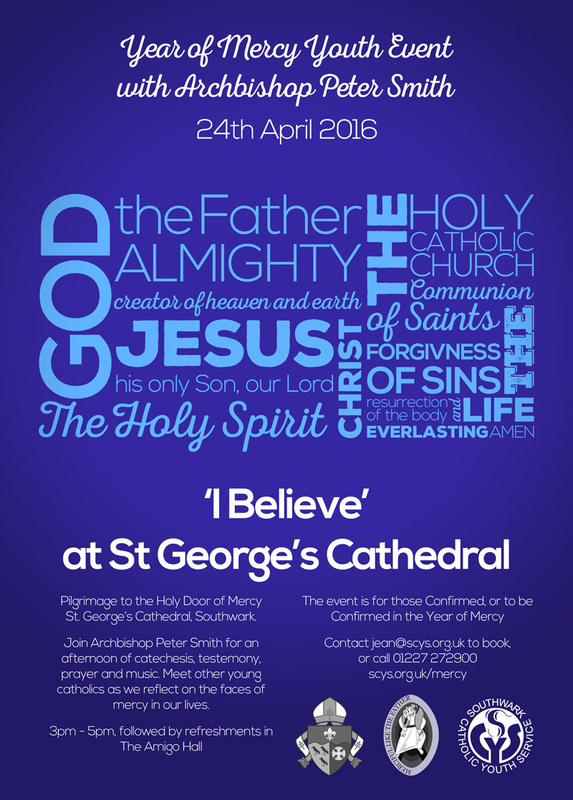 Visit scys.org.uk/mercy for more info or to see our other events. St Francis Xavier 6th Form College: is seeking a foundation governor. This is a voluntary role for a practising Catholic who has the time to attend and participate in at least three full Board evening meetings each year and, ideally, also serve on a governors’ committee. The governors are particularly keen (but not exclusively) to hear from a volunteer with experience in Human Resources management. If you are interested, or would like further information, please contact Eleanor Lewis, Clerk to the Governors (020 8772 6062 – e.lewis@sfx.ac.uk). Closing date for expressions of interest: Monday 1st February. St Bede’s Social Club: Open Sundays 12pm–2.30pm and Fridays 8.30pm–11pm. Games available – Please ask at the bar.